Medieval cuisine doesn't have to be high in fat or calories if you watch your portion sizes and avoid high calorie foods like cheese, butter, cream, and fatty meats. My study of Medieval recipes reveals very few dishes were served swimming in cream sauces, or dipped in batter and deep fried, though this is what you will find at Renaissance faires. Most meats were boiled or roasted on a spit which reduces the fat content. They were served with spicy sauces or poached in wine with fruit. Cooked meats were often deboned, chopped fine, and mashed with cooked vegetables or stewed fruit, spices, then served on toast. Not only did this make the meat very tasty, but it also reduced the calories and balanced the nutrition. Pastry crusts on meat pies were not made with butter or fat. In fact they didn't even eat the crust but treated it as a disposable bowl. This made medieval meat pies lower in calories than modern meat pies which have most of their calories in the crust. Desserts, if served, were typically fruit and nuts sweetened with honey. Sugar was so expensive and rare that it was treated as a spice and only sprinkled in food while cooking like salt. Records clearly indicate that everyone ate a pound or more of bread everyday. A lot of that bread was eaten soaked in gravy or broth as in this dish. Here is a very flavorful Easter meal that everyone can enjoy without worrying about calories. To keep it low fat, I recommend using a fully-cooked, spit-roasted chicken. Since most of the fat is already melted-off, you are starting with a lower calorie bird. The chicken is cooked in wine and served with a Medieval stuffing called "sops" that is made without adding any butter. You could serve the chicken with rice or noodles but that would add about 100 more calories per serving to the dish and not be as high in nutrition as sops made from whole grain bread. In this meal the salad is served last and is sweet so it also satisfies your desire for something sugary at the end of the meal. Add a side dish of steamed asparagus or cooked cabbage dressed with a little bit of butter and you have a light Medieval meal for about 600 calories. Gelyne is old French for Hen and as close as I can tell, dubatte is a wine bath. I was attracted to this recipe because of the odd name. As I translated the old recipe, I realized that it was an early version of Coq au Vin which is a French recipe for chicken stewed in red wine with mushrooms and pearl onions. 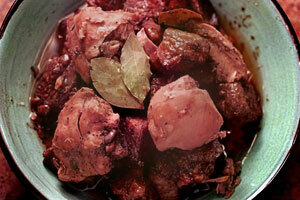 The meat is rendered especially tender and moist and the red wine dyes it to a marvelous reddish-brown color. So keeping that in mind I came up with an easy to prepare modern version of this old 15th century recipe. - Austin, Thomas. Two Fifteenth-Century Cookery-Books. Harleian MS. 279 & Harl. MS. 4016, with extracts from Ashmole MS. 1429, Laud MS. 553, & Douce MS 55. London: for The Early English Text Society by N. Trübner & Co., 1888. Translation: Take a hen, and roast her almost enough, and chop her into serving size pieces, and throw her in a pot. and throw thereto fresh both and half as much wine, and cloves, mace, pepper, cinnamon, and steep it (referring to the bread) with the same broth, fair bread and vinegar: and when it is enough, serve it forth. Here is the same recipe with modern measurements. The medieval way to make this dish is to mix cubed bread or toast into the gravy until it is all soaked up to make "sops." Serve each person a piece of chicken and a large spoonful of sops on the side. 1 roasted chicken cut up or 8 pieces of chicken, browned in a skillet. Heat the oven to 300 degrees. Put the pieces of chicken in a large skillet or cast iron casserole dish with a lid. Pour in enough wine and stock to just cover the chicken pieces. (This will vary depending on the size of the dish and the chicken.) Add the spices. bring to boil, reduce to simmer. Cover and place in the oven for 45 minutes. Remove from the oven. Remove the chicken to a warm platter and cover with foil. Stir the vinegar into the casserole dish. Taste and adjust the seasoning by adding salt and sugar to taste. Remove a cup of the liquid and pour over two cups of the bread cubes (about 6 slices). Mix until it looks like cooked cream of wheat instead of fat cubes of bread. Add more broth if needed. Pour the bread and broth mixture into the casserole dish and stir until it is smooth. Keep adding bread cubes until all the gravy is soaked up to create "sops". Place the chicken back in the casserole dish and return to the oven uncovered for 15 minutes more. Makes 8 servings. Nutrition facts per serving: calories 297, fat 5g, saturated fat 1g, sodium 532mg, dietary fiber 2g, sugar 3g, protien 34g. Though there is no specific recipe for a grilled pear salad, I created this salad in the Medieval-style to go with Hen in Wine Sauce. Raw fruit was thought to cause illness so stone fruits were usually cooked in the Middle Ages. Fruit, nuts and salads were typically served as the last course to "top things off." Char de Wardon means grilled or roasted pears and is found in many medieval recipes, often spiced with cinnamon, ginger and sugar. Green salads were made from a variety of tender shoots and leaf lettuces, but parsley, mint, and other aromatics were mixed in to sweeten the breath at the end of a large meal. Arugala, another aromatic green, (also known as rocket) gives this salad a woodsy nuttiness. 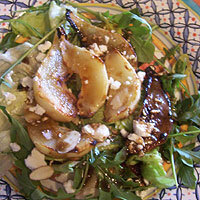 The tart Feta cheese and balsamic vinegrette dressing compliment the sweetness of the cooked pears. You can substitute fresh pears for canned pears when pears are in season. The pears can be roasted ahead and refrigerated making this salad easy to assemble right before serving. 8 pear halves in syrup, drained and sliced lengthwise or 4 fresh pears. Move the oven rack to the top position. Heat the oven broiler. Meanwhile mix the pear syrup, honey and spices in a quart size bowl. Toss the sliced pears with the mixture and arrange on a cookie sheet. Broil for 5 minutes, remove and flip the pears slices, broil for an additional 5 minutes until brown. Remove from the oven and allow to cool. In the same bowl mix all the vinegrette ingredients into the leftover pear syrup with a wire whisk until emulsified. Mix the arugala with the Spring greens and place a bed of lettuces on each plate. Arrange 4 to 6 slices of pear on top. Sprinkle the almonds and Feta cheese over the tops and spoon 1 to 2 teaspoons of dressing over each serving. Serves 8. Nutrition facts per serving: calories 165, fat 8g, saturated fat 3g, sodium 174mg, dietary fiber 2g, sugar 9g, protien 3g. If you want to add this article to your list of favorites or email it to a friend, please use this permanent URL, https://stores.renstore.com/-strse-template/1104A/Page.bok. Permission is granted by the author to quote from this page or use it in handouts as long as you include a link back to Renstore.com.